Healthy skin starts with hydration. Regardless of the weather, it is important to always have your eight to ten glasses of water daily. The body is approximately 70 percent water. Thus maintaining proper hydration especially when the body expels water in the form of sweat when it’s hot and in the for of urine when it’s cold. 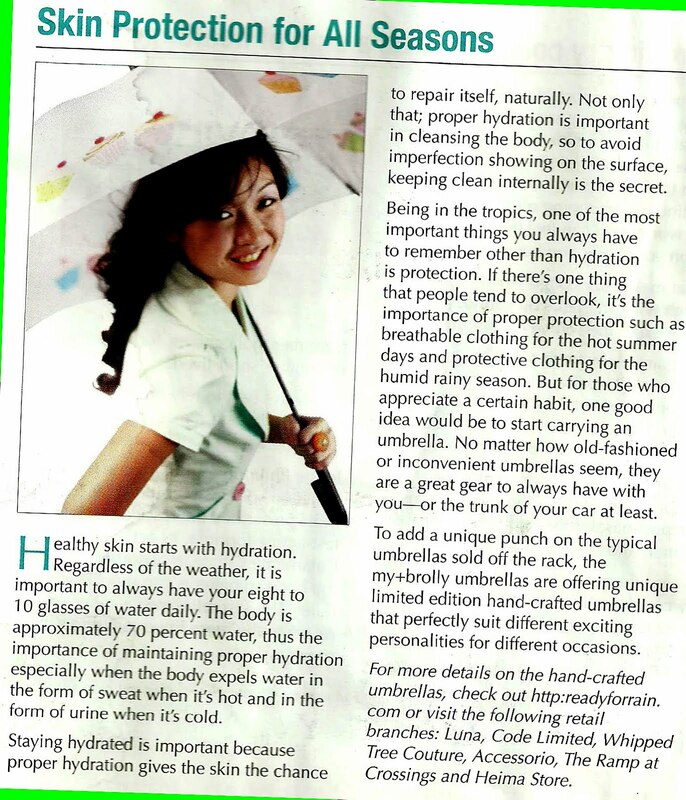 Staying hydrated is important because proper hydration gives the skin the chance to repair itself, naturally. Not only that, proper hydration is important in cleansing the body, so to avoid imperfection showing on the surface, keeping clean internally is the secret. 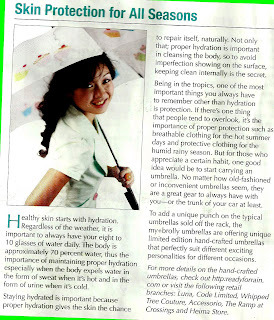 Being in the tropics, one of the most important things you always have to remember other than hydration is protection such as breathable clothing for the hot summer days and protective clothing for the humid rainy season. But for those who appreciate a certain habit, one good idea would be to start carrying an umbrella. No matter how old fashioned or inconvenient umbrellas seem, they are a great gear to always have with you—or the trunk of your car at least. To add a unique punch on the typical umbrellas sold off the rack, the my+brolly umbrellas are offering unique limited edition hand-crafted umbrellas that perfectly suit different exciting personalities for different occasions. I apologize for the not-so-wonderful screen shot of the article. I don't know why but I am hardly keen on keeping my published anything despite the complete destructive "FML" feeling I get when I realize I don't have a copy of my anything published anymore. When I saw how folded and crumpled my take note only copy of Zen Health magazine May-June 2010 issue, I panicked. I looked for a back issue in stores like National Book Store and Book Sale, but to my demise, there was none. I was left with no other choice than to scan the my take note only copy of the magazine. Until the time I find myself a better copy of the said issue (Hello! If you have a copy, please let me scan it at least! ), I have no choice but to settle... meh! Here's to protecting the skin and backing up files! If you wish to read more, please check out my Portfolio. I am always open for nice and interesting writing projects. Email me here. I'm also on Facebook and Twitter.